Please refer to our stock # 9777 when inquiring. 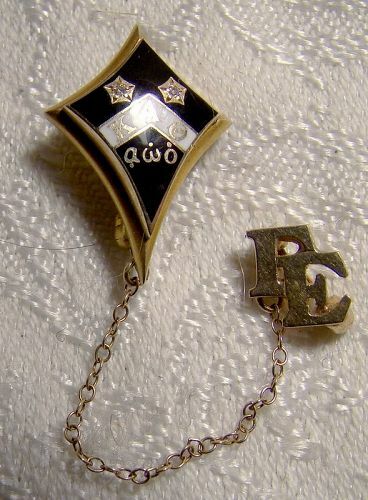 A 14k Kappa Alpha Theta sorority pin brooch with diamonds and enamel - Alpha Omega Omicron 1940s. This fine quality pin features black and white enamel, two tiny diamonds and a Gamma Epsilon house safety pin on a chain. The 7/8 x 5/8" main pin itself has the KAT sorority and the AOO Greek letters and it has an etched dedication GE (Gamma Epsilon) J. DANIEL 11.6.48 on the back. Each pin has a safety clasp and each pin is unsigned but they both test as 14k gold (the main pin has an LBG maker's mark and probable carat stamp under the clasp). this pin weighs 4.1 grams and it is in excellent condition with no chips, cracks, dents, bends, corrosion, damage or repairs. All items are thoroughly and conservatively graded and all condition issues are noted; all items are vintage or antique and may have slight signs of gentle use. Expedited tracked and insured parcel shipping to the U.S. starts at $21 (other spots may vary, air is higher). Items paid with a credit card will be shipped to confirmed addresses only. We do ship internationally. All of our prices are in $US. PLEASE NOTE: We DO NOT accept PayPal.